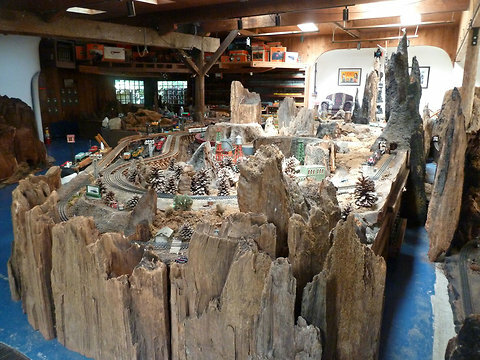 Earlier, I wrote about the auction of Neil Young’s O scale model trains. 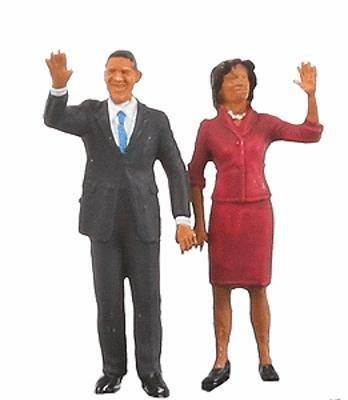 They were sold earlier this month—for almost $300,000. Over 230 items from his collection were on sale, including his custom-painted Commodore Vanderbilt 4-6-4 that sold for $10,000. A portion of the proceeds from the sale will go to the Bridge School in California, which helps children with severe speech and physical impairments. 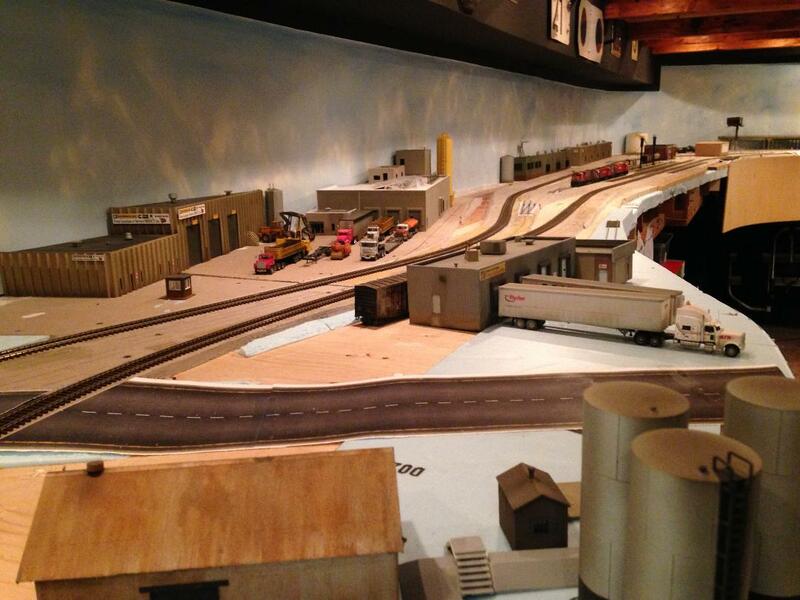 One of the best model railroads in Canada a few years back was Pierre Dion’s CP Rail Quebec Sub. 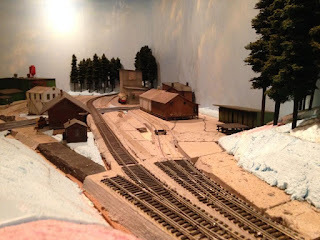 I featured Pierre’s layout on this blog back in 2011. His HO scale layout was set in the late 1980s-early 1990, just before CP Rail began to sell or abandon its lines in Quebec. The layout was in a 17 by 21 foot room, and featured a double track mainline through great looking scenery. 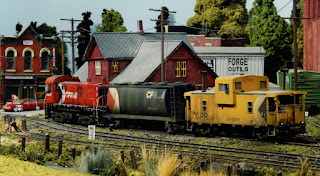 As I wrote back then, Pierre has a knack for creating amazing and believable scenery through the creative use of ground cover, ballast and trees, along with great buildings and various line-side and other details. Or, to put it another way, Pierre was the Bob Fallowfield of scenery before Bob came along. 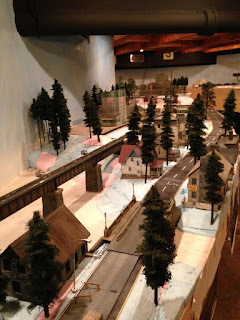 That great Canadian model railroad is gone; Pierre is recreating Quebec in the 1980s-90s with a new layout, as seen in photos on this post. I asked Pierre for an update on the new layout. He said the room is finished, benchwork, track bed, landscape and backdrop are all finished, the rolling stock and locomotives are ready to go, and there are 125+ structures are ready for placement on the layout. Right now he is at the start of wiring for DCC. I look forward to seeing more photos when the layout is done! Lloyd had never been on a train before. Now retired after owning a plumbing business for 45 years, he was on his way to London to see his niece. Lloyd was sitting beside me on Train 85, VIA Rail from Toronto to London in November. I was only going as far as Kitchener this day. 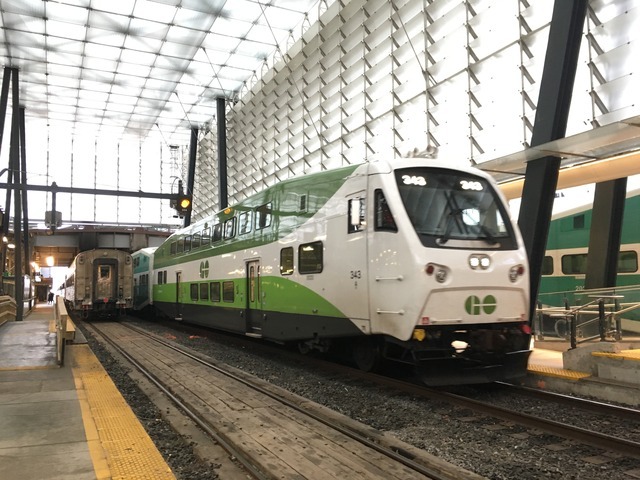 As the train—all two cars of it—rolled through the southern Ontario countryside, he exclaimed about the views out the window. “You see a city differently from a train than from the highway,” he said. Later, as we rolled through the countryside, we talked about the many fields and farms you could see from the train—things you couldn’t see from the highway. Train 85 at Union Station. The Bullet—it’s official name was “The Caribou”—was much-loved by Newfoundlanders. It got its ironic and affectionate name because of how slow it was, taking 23 hours to traverse the 900 kilometres from St. John’s to Port-aux-Basque. Lloyd told me a joke about the train’s slowness. 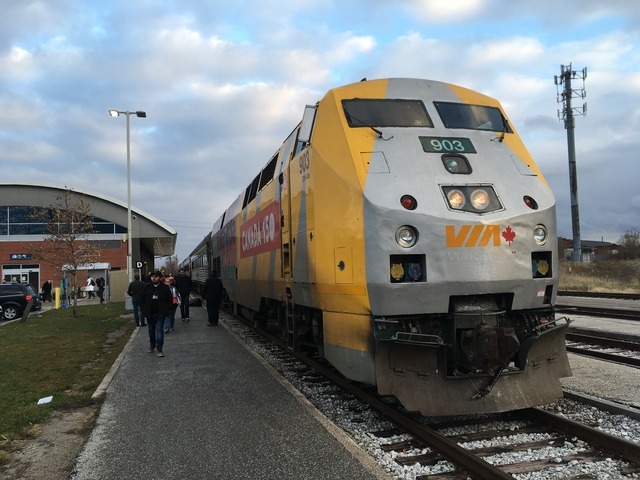 A pregnant woman asked the conductor if the train could hurry up—she was about to have a baby and needed to get to the hospital in St. John’s. 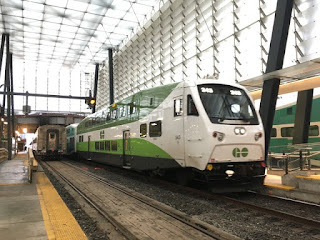 I had boarded Train 85 at Toronto’s Union Station. Construction started in 1910. 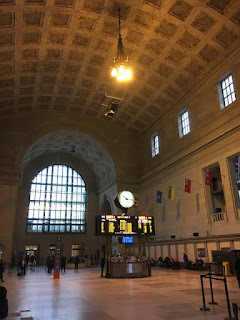 I travel through Union station several times each year, either taking VIA or using the Union-Pearson Express between downtown and the airport. Whenever I’m there, I look up at the arched concourse roof and think of my father. During the war years, he worked making armaments at a factory in Peterborough. He had tried to enlist in the army, like his friends, but poor health prevented him from doing “his bit” in that way. So he made the materials that helped the troops win the war. Being from St. Catharines—my hometown—he made frequent trips by train between Peterborough and that southern Ontario city. Each time, he would have changed trains in Toronto. 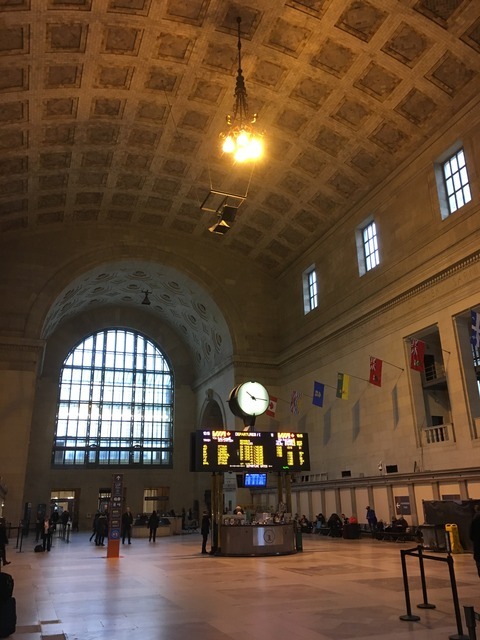 And when I am at Union station, I think of him: Did his eyes turn upwards at the same roof? Did he walk the same platforms? Sometimes the walls between past and present collapse in one’s mind and I can see a young man in his mid-20s, waiting for a train in a long coat and fedora. But that’s not what you can see these days. The day I was there a couple of VIA trains were on nearby tracks, and a GO Transit train entered and left the station while I was there. I left Lloyd when I de-trained in Kitchener for the night. The next day I caught the same train (85) to London, where I changed to Train 73 to Windsor. Snow was falling when the train arrived, and we traveled through it to London. 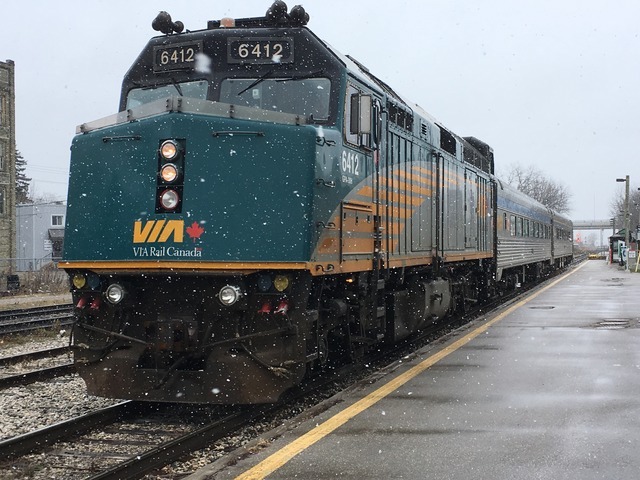 Train 85 arrives in the snow. My seatmate that time was a woman who put in her ear buds and checked messages on her phone during the trip; no conversations with her. But that’s OK. I enjoyed the rocking of the rails and looking out the window as we slipped through the snow. November 7 is the 70th anniversary of the Friendship Train. 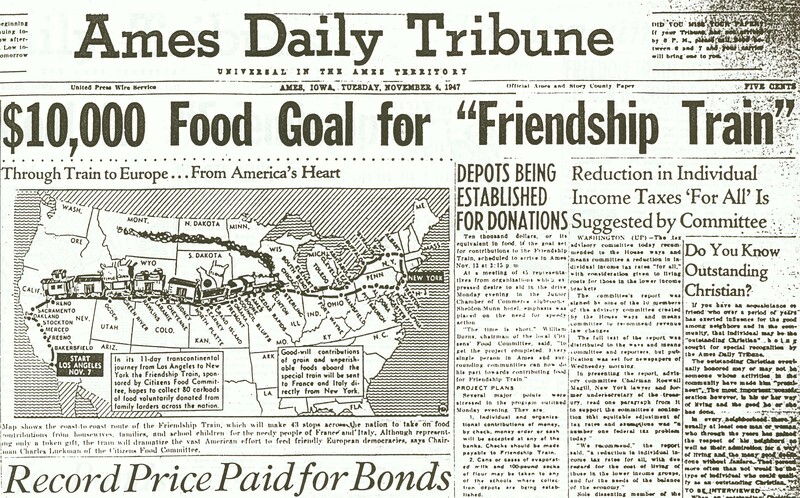 On that date the Train, filled with donations of food, clothing and other items for Europeans suffering from the after-effects of World War II, started its journey across America. The Train was conceived by journalist Drew Pearson as a way to help people in France and Italy suffering from the after-effects of World War II. 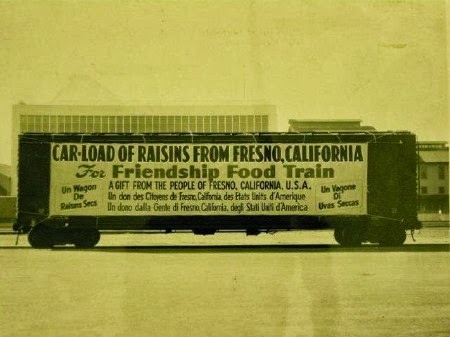 The Friendship Train began in Los Angeles and travelled to New York. Cars filled with relief supplies were added along the way. 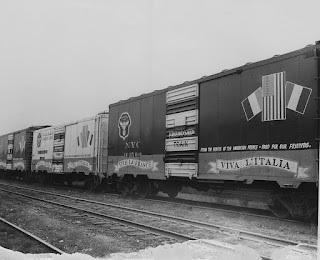 A northern collection of cars started in Indiana and joined the rest of the Train in New York. 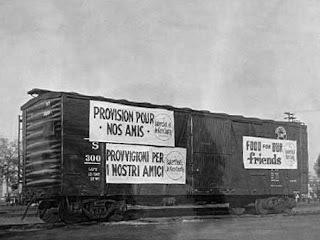 The Trains was easy to spot; communities that filled the cars put signs and banners on them indicating where the donated items had come from. 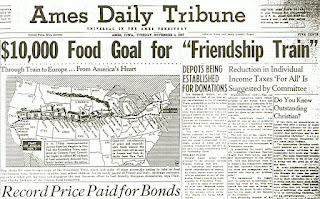 Altogether, 270 cars of food and other items were filled and made their way to New York. The value of the donated materials was set at $40 million. In response, the French created the Merci (“thank-you”) Train, which was sent to America in 1949. Some of the cars are still on display in the U.S.
My interest in the Friendship Train arose because of a Mennonite Central Committee boxcar that was inspired by the Friendship Train. 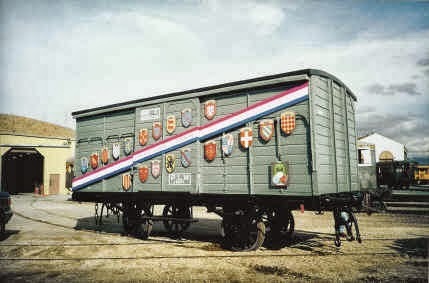 I used to work for that relief and development agency, and was intrigued when I first learned about the HO scale car. I ended up making versions of the car for MCC’s 75th anniversary as a fundraiser, and have come to own N, HO and O scale versions of the car. You can read more about the Friendship Train, and my collection here. You can watch a video of the train here. 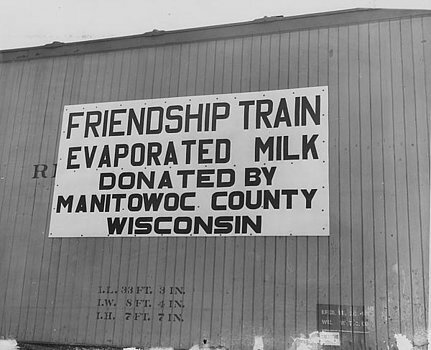 A Facebook page about the Friendship Train can be found here, with lots of photos and other information. 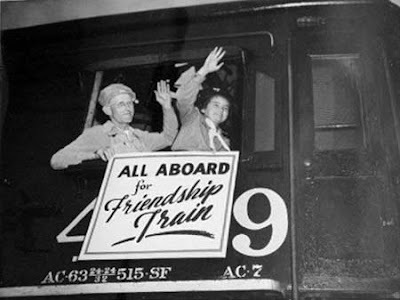 I think it’s safe to say we will never see another train like it—even though the world sure could use a lot more friendship today. This psychedelic Hudson from Young's collection can be yours! Canadian-born Neil Young—who I have written about previously on this blog—is well-known in model railroad circles for is love of model trains. Now he is selling part of his large O Gauge model train collection. “Collecting all of these items has been my great joy. They have provided a source of inspiration, fun and creativity throughout my life,” Young said in a statement. According to Reuters, Young is putting more than 230 of his vast collection of Lionel trains up for auction at Julien’s Auctions in Los Angeles on December 9. Some of them are listed at up to $9,000. 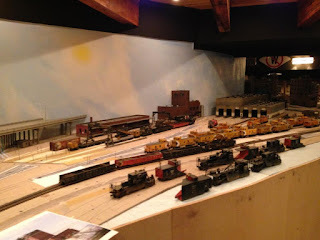 Young became a model railroader as a way to connect with his son Ben, who has cerebral palsy. In his book Waging Heavy Peace he wrote that “I was just getting back into trains at the time, reintroducing myself to a pastime I enjoyed as a child. 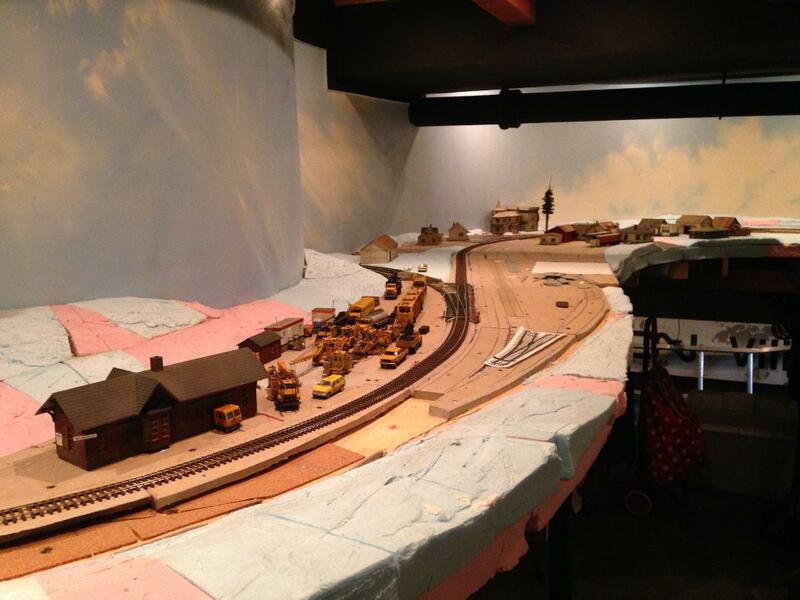 Sharing the building of the layout together was one of our happiest times." Young devised a control system to allow Ben to operate trains. "It took a lot of effort, but it was very rewarding for him to see the cause and effect in action. Ben was empowered by this." Later, the layout became a refuge for him. Over the years Young, who once became a part-owner of Lionel, adopted an online alter ego named Clyde Coil to talk about his trains. This included a website called Coil Couplers of America. But back to the auction. 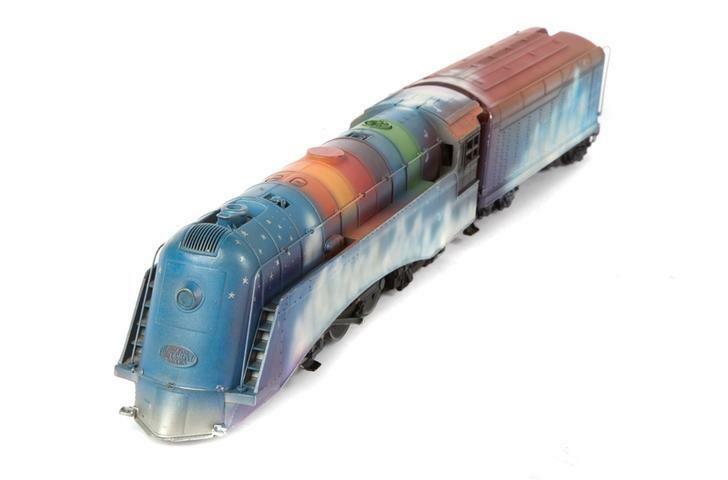 Highlights include a Lionel Hudson factory prototype locomotive, and a psychedelic Hudson. Young is also selling some of his classic car collection. 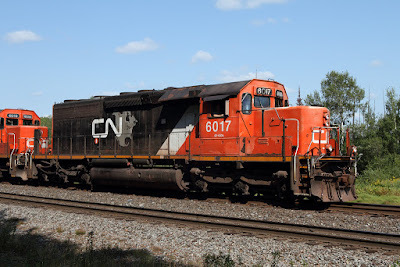 Readers of this blog know that I like SD40-2s. That’s why the Manitoba & Minnesota Sub. is set in the early to mid-1990s, when the SD40-2 was king. It’s also why I was so excited when Bowser brought out its great-looking and great-running CP Rail SD40-2 models—including the Red Barn. But if time is frozen in my basement on the M & M Sub., it marches on in real life on both the CPR and CN. 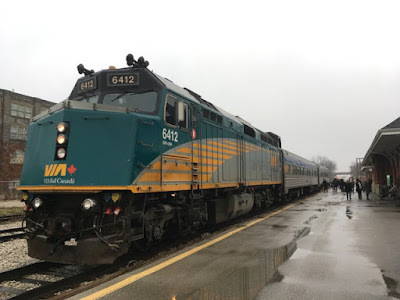 According to the latest information I can find (on Canadian Railway Observations), as of last year there were only 13 SD40-2s on the CP roster, with only four of those operational (and based in St. Paul, MN). The rest were stored. Some SD40-2s are being upgraded into that railway’s new SD30C-ECO program, so that’s good news. But it’s not the same. 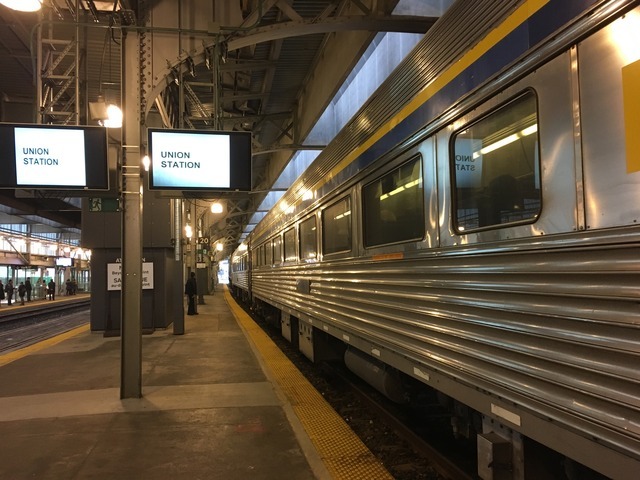 Meantime, the famed MultiMark is also almost gone; as of last year only two units (5911 and 5863) still sport the iconic mark (again, according to CRO). Once they are gone, the MultiMark will cease to exist in real life. Meanwhile, according to a report in the September issue of Railfan & Railroad CN has only four SD40-2s in operation, with seven stored serviceable and 142 stored unserviceable. 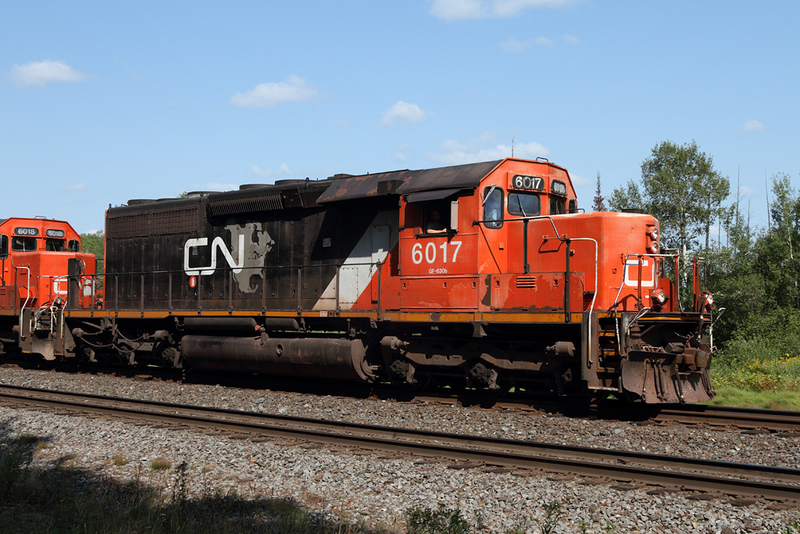 One of them is 6017 (in the photo above). 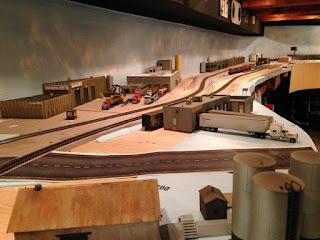 In 2010, I interviewed local modeler Don McKinnon about his home layout, the Malamute and Klondike. With construction on the layout starting in 1950, it was the oldest home layout in Winnipeg by the time Don died in 2013. At 23 years old, I’m beginning to feel the same way about the M & M Sub. layout. 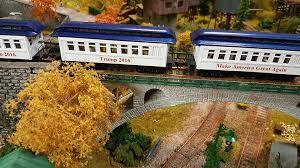 If there’s one thing we all probably would like, it’s to keep politics out of model railroading. No more fighting in clubs over control systems, era, track, scenery or the type of coffee people buy, or anything else. But what about putting politicians on model trains? That’s what’s happening with the "President Donald Trump Express" from the Bradford Exchange. That may fire up Republicans and annoy Democrats. But before we get into a partisan, um, “conversation,” everyone should know that the Exchange produced a President Obama train when he was elected, too. 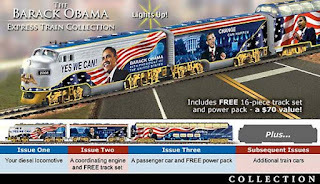 Curious about the intersection of politics and trains, I decided to see if there were any other manufacturers producing presidential-themed items. And, of course, there are. 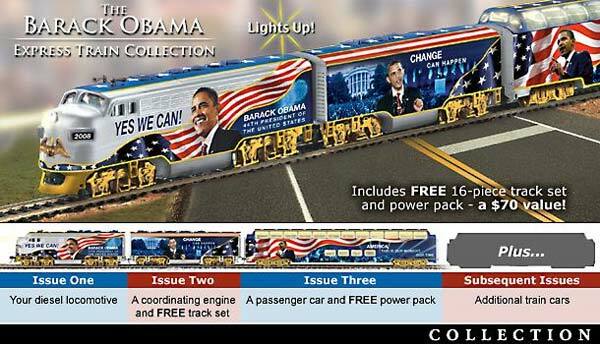 Micro-Trains has a Presidential Series for rolling stock, featuring a number of past presidents—and the current one. Con-Cor also produced a President Trump car. I can’t find a car for any other president, though. Kato produced a model of the prototype George Bush #4141 in N scale. 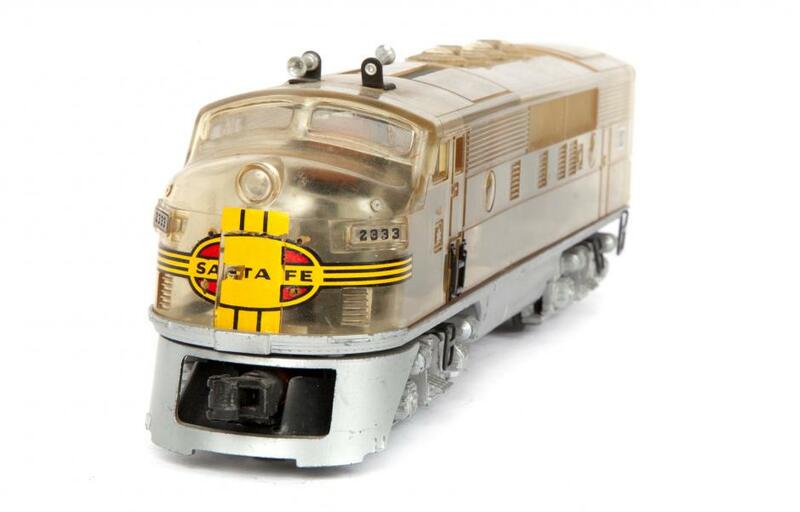 And USA Trains made one in G scale. 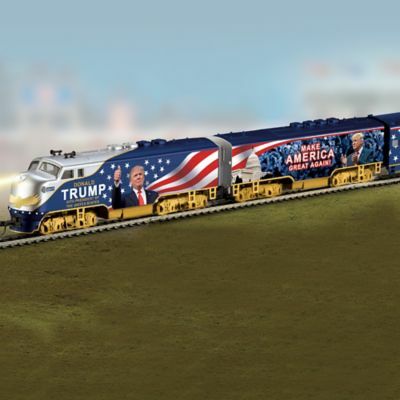 Individual modelers also got in on the action, like this one who made his own “Make America Great Again” train. 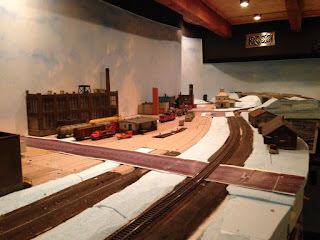 So, there we are; politics and model railroading mixing. And so far, nobody is tweeting: "Sad." Click here for a topical index to the blog. 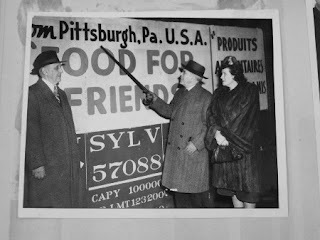 Click here for an index by year to the blog. 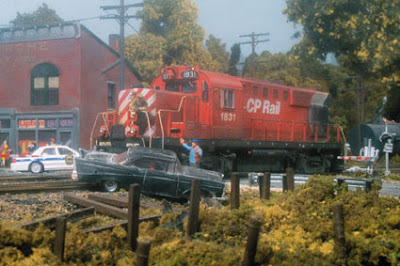 Click here for an index of Great Canadian Model Railroads. 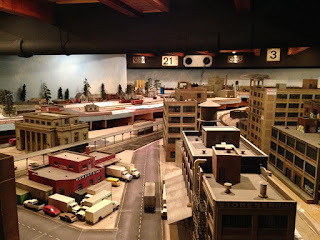 Click here for an overview of the layout from the December, 2009 Railroad Model Craftsman. Click here to view videos of the layout on YouTube. Click here for a track plan.